How to make crave-worthy fried cabbage with bacon and garlic. 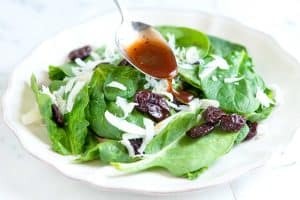 Simple, quick, and delicious! 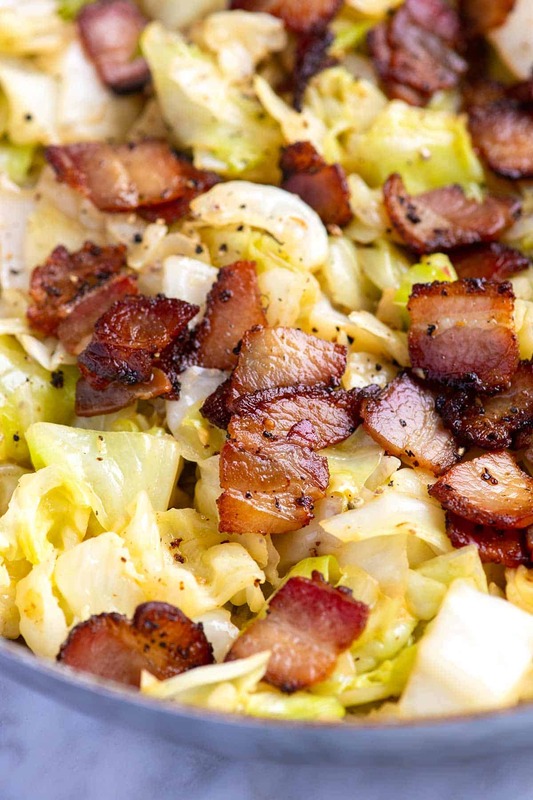 Jump to the Bacon Fried Cabbage Recipe or read on to see our tips for making it. Here’s another way to cook cabbage! This healthier fried cabbage is just as quick to make and tastes incredible. This is a simple recipe for cooking cabbage. Thanks to bacon and garlic, it’s delicious, too. If you have never fried or sauteed cabbage before, you need to start. As cabbage cooks in the frying pan, it wilts, turns tender, and becomes sweet. Cabbage may sound like a boring side, but this is one of our favorite sides to make. Fried cabbage is easy, and it’s one the first sides to go on the table. We “fry” our cabbage in some bacon fat. Not too much fat that it’s greasy but just enough that the cabbage picks up the smokey and savory flavors of the bacon. Cook bacon in a skillet until the fat has rendered and the bacon is crispy. Save the crispy bacon for serving and save a bit of the rendered fat to cook the cabbage in. Cook the cabbage in the bacon fat along with some garlic, red pepper flakes, and a little salt. When the cabbage is wilted, sweet, and starting to brown around the edges, toss in a little mustard, apple cider vinegar, and the cooked bacon from earlier. 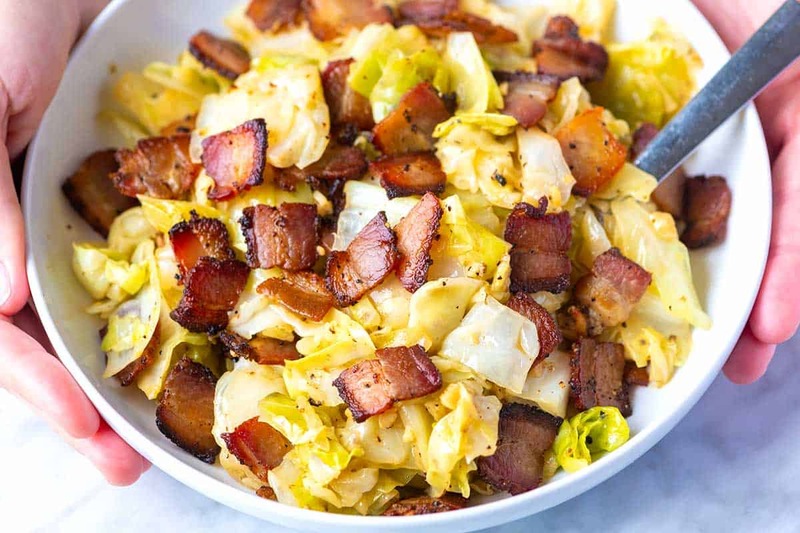 The mustard and vinegar add a pop of acid to the cabbage which balances the sweet cabbage and smokey bacon. We like to keep things simple when it comes to the seasonings. Garlic, a little heat from red pepper flakes, and tang from mustard and vinegar. You can stir in other seasonings, too. 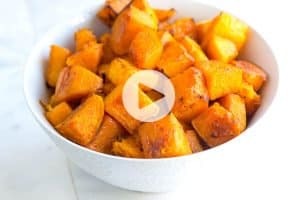 Try a little paprika or turmeric for color, onion powder, chili powder, Cajun seasoning, Creole seasoning or cayenne pepper for even more heat. Ham and Cabbage Soup — This soup is hearty, healthy, easy to make, and tastes fantastic. Easy Homemade Vegetable Soup — When we’re looking for a comforting meal packed with vegetables, this easy veggie soup is where we turn. Easy Chile Butter Shrimp Tacos with a Purple Cabbage Slaw — Meet your new favorite shrimp tacos. There are chile butter shrimp, mashed avocado and a quick and crunchy slaw. Seriously Good Homemade Coleslaw or try our dairy-free version — both have rave reviews! 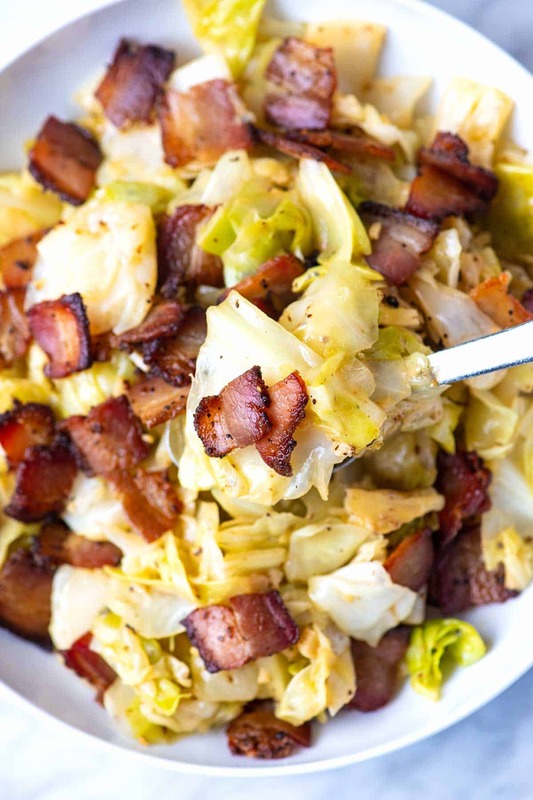 Bacon makes this simply fried cabbage crave-worthy. As the cabbage cooks in the pan, it wilts, turns tender, and becomes sweet. White cabbage is our favorite for this, but other cabbage varieties will work. Keep in mind, though, that Napa cabbage will release more moisture and won’t brown as nicely in the pan. 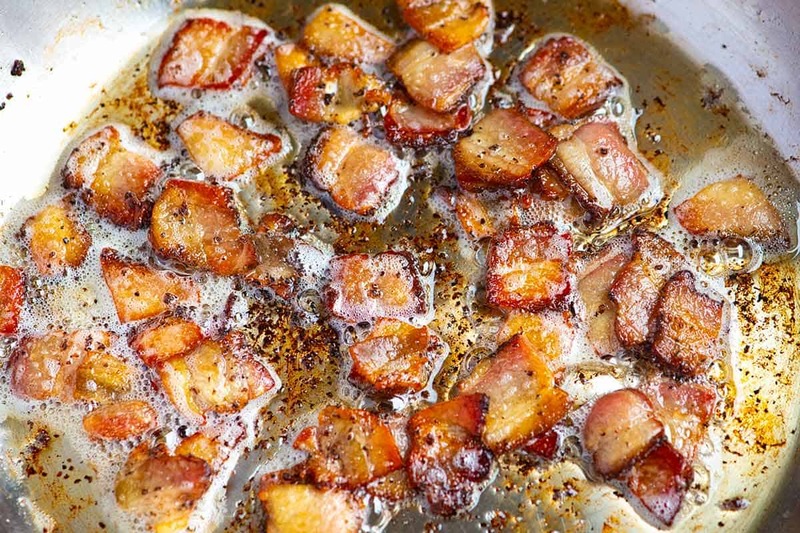 We love using peppered bacon for extra flavor, but your favorite type of bacon will also work. Add bacon, in one layer, to a large skillet over medium heat. Cook, stirring occasionally until the fat renders and the bacon is crispy; 6 to 8 minutes. Take the pan off of the heat, and then use a slotted spoon to transfer the bacon to a bowl and save for later. Place the pan back onto medium-high heat then add the cabbage, garlic, red pepper flakes, and the salt. It might seem like too much cabbage for the pan, but as it cooks, the cabbage will wilt down. Cook, occasionally stirring until the cabbage is tender and some of the cabbage begins to turn light brown; 10 to 15 minutes. Stir in the mustard, apple cider vinegar, and the reserved cooked bacon. Taste then adjust with more salt, pepper, and vinegar as needed. To chop the cabbage, quarter the cabbage through the core, and then cut out the core. 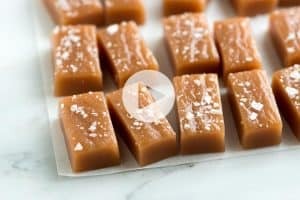 Chop each quarter into squares or bite-size pieces. Rinse and spin or pat very dry. If you aren’t into bacon, no worries! Swap the bacon for sausage or go meatless and use butter or olive oil. This cabbage recipe is excellent with onions, add them to the pan at the same time as the cabbage. Nutrition Facts: The nutrition facts provided below are estimates. We have used the USDA database to calculate approximate values. Wow! This looks amazing! Total cabbage & bacon fans, here. I look forward to making this dish. Thank you so much for sharing!